Impromptu™ lounge seating flourishes in today's fast-paced environment of creativity. The new economy requires that all office tools, including furniture, be prepared to serve in multiple capacities. Impromptu lounge seating is up to that challenge. With the pivot and lift of its occasional tablet, Impromptu changes from a classically designed, contemporary lounge piece to a powerful workstation. Available on casters with either a large or a small tablet in either right or left variations, Impromptu is also available on feet and with or without a tablet. Two different tablet sizes is great so you can get the chair as you need to fit a laptop, or just a pad. And check out that mesh pocket on the side of the chair. 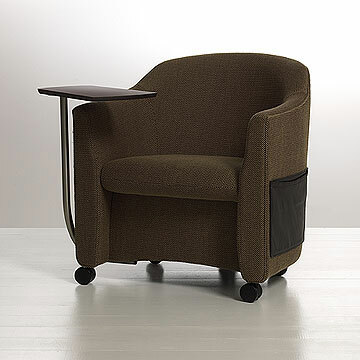 This hybrid seating is a whole new class of chair for the workplace. Its come out of the need to accommodate new activities in the office. Team meetings, brainstorming, casual meetings. 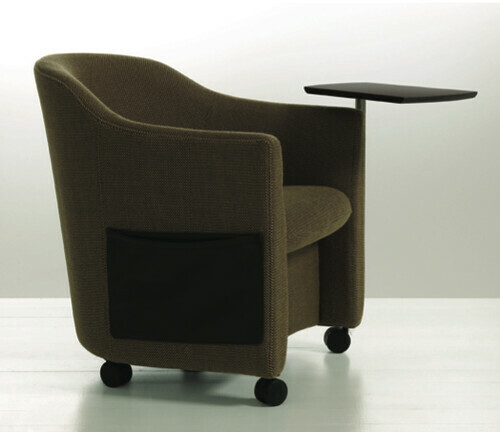 Putting these in your reception area gives your visitors a place to use their laptop during otherwise idle time. big table desking for hackers?